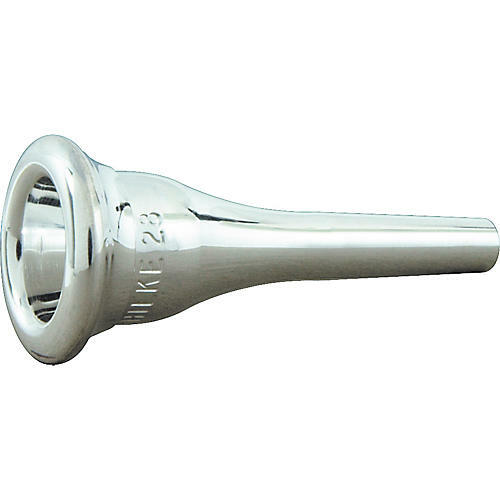 The Schilke Standard Series French Horn Mouthpieces in Silver feature a combination of rim, cup diameter, cup volume and backbore to meet any playing situation. The Cup Diameter (First number in label): cups range from shallow to deep in numeric order from low to high. Cup Volume (First letter in label): volume ranges from A to E from small to large - A: Small; B: Medium-Small; C: Medium (Standard); D: Medium-Large; E: Large. The Rim Contour (Second number in label): rims range from roundest to slightly rounded in numeric order from low to high - 1: Roundest; 2: Simi-Round; 3: Standard; 4: Semi-Flat; 5: Slightly Rounded. The Backbore (Last letter in label): backbores range from tight to large in alphabetical order: a: Tight; b: Straight; c: Standard; d: Slightly Curved Out; e: Large. 27 16.25 .640 A narrow diameter and thin rim creates a special mouthpiece for the first horn player. 28 16.15 .636 A true "French" model mouthpiece having a small cup and throat that definitely favors the high register. Recommended for the Descant Horn. 29 17.53 .690 Offers a balanced option that is very adaptable to both the younger player and the professional needing a stronger upper register with a large rim diameter, standard rim contour, cup, and smaller bore. 30B 16.92 .666 This model was designed with a smaller "B" style cup and thin, flat rim. 30 17.03 .670 The original Farkas Model, the wide rounded rim and fairly deep cup makes the 30 a good all-around mouthpiece for the experienced player. 31 17.14 .675 This model has a V shaped cup, thicker standard rim and a slightly larger diameter to aid in producing a greater volume of sound. 31B 17.40 .687 A wide rim with a higher center point and a medium depth bowl shaped cup produces a rich, dark tone. 31C2 17.43 .688 The 31C2 has a very thin rim and medium-large cup offering a great volume of tone. 32 17.83 .702 The extra large cup diameter, cup volume, and backbore produces a rich, dark tone color.